October 4, 2017 – Starting in 2018 loyal Accent Inns customers have an un-beer-lievable new Accent Inn perk to look forward to. Sure, you are used to the perks you have always come to expect staying with us, free Wi-Fi, free parking, free cookies and hot chocolate in the winter…now we are partnering with Phillip’s Brewing & Malting Co to bring you a new perk—FREE BEER!Introducing Accent Inns’ very own beer we call the Inn-Dependent Pilsner. At Accent Inns we are locally owned and independently operated, which means we have the freedom to do what we want. 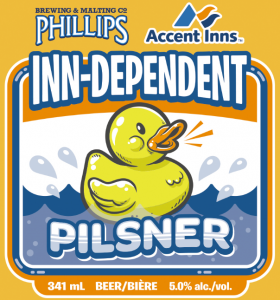 So as a thank you for choosing to stay with us we want you to kick off your shoes and quack open a complimentary pilsner hand-crafted by Phillip’s Brewing & Malting Co., a local and independent brewery located in Victoria B.C. Just down the road from our first hotel and our head office. Now not every person who stays with us will get free beer, it’s a special perk for our guests that stay with us a lot. Loyal guests just never know what they might check in and…surprise! It’s your Accent Inns beer-thday. Worried you don’t stay with us enough to get this new perk? Don’t worry, be hoppy. We still think you are worth it, just give us a call and ask if you can have one during your stay. Sign up for our newsletter at the bottom of this page and we will send you a booking link to book your brewtiful stay as soon as our new beer arrives! Cheers!